One of the most disappointing trends in recent years has been the steadily increasing road toll. From a low of 249 deaths in the year to the end of Feb-2014, as of the end of Feb 2018 we’re at 385 and as of the Tuesday it reached 399. If current trends continue, by the end of the year that number could be over 450 deaths. Additionally, there are thousands of people injured or seriously injured every year. As a result of those components, the Ministry is able to come up with the following costs per death and injury. The updated value of statistical life is $4.21 million per fatality, at June 2017 prices. Adding the other social cost components gives an updated average social cost per fatality of $4,242,100. For non-fatal injuries, the updated average social cost is estimated at $446,000 per serious injury and $23,800 per minor injury. 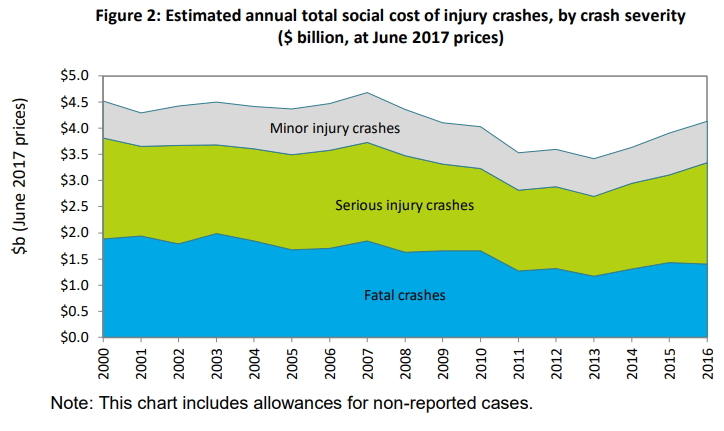 After scaling up the estimates to account for non-reported cases, the average social cost estimates increase to $786,000 per reported serious injury and $82,000 per reported minor injury. There are some big costs in there and when it’s all added up, the total is over $4 billion. 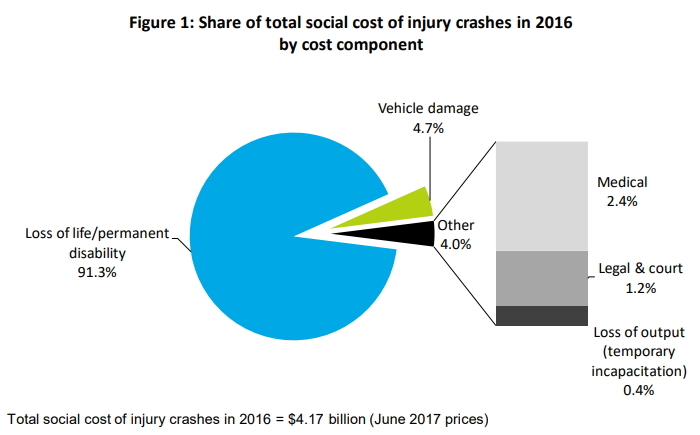 The total social cost of motor vehicle injury crashes in 2016 is estimated at approximately $4.17 billion, at June 2017 prices. This represents an increase of $0.3 billion (or 7.8 percent) compared to the previous year ($3.87 billion in 2015). This increase reflects a 2.5 percent increase in the total number of fatalities (from 319 in 2015 to 327 in 2016) and a 17 percent increase in the estimated total number of serious injuries (from 3,775 in 2015 to 4,410 in 2016). There was a small reduction (2 percent) in the estimated total number of minor injuries (from 34,817 in 2015 to 34,133 in 2016). The costs are reflected in this chart and as you’d expect, death and serious injuries dominate the outcomes, accounting for over 90% of the total costs. And here’s what it looks like over time. Like with the overall toll, the cost of crashes was falling for some time but that’s changed in recent ears. 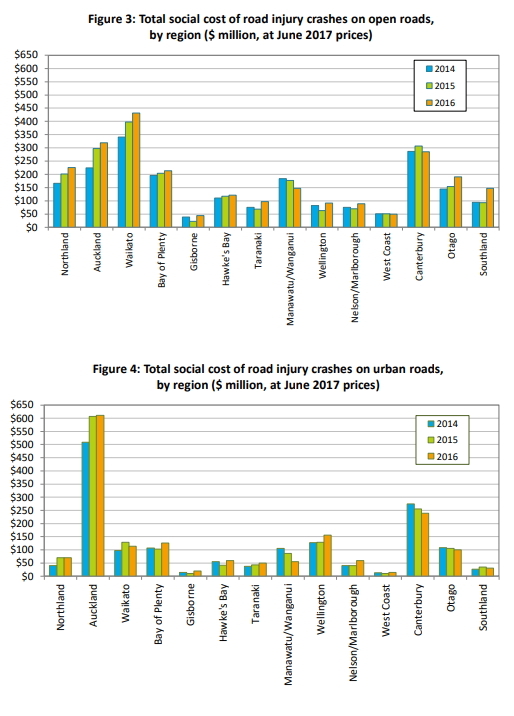 Finally, these graphs show the cost by region and whether it is an open or urban road. With the number of deaths and injuries each increasing by 15% in 2017, these costs are only going to go up and push towards the $5 billion mark. While we can’t do anything about 2017 result, it’s urgent the government, councils and transport agencies focus on delivering safety projects. Part of that will require more funding from the government and I believe we’ll see the upcoming Government Policy Statement support that. Distraction would have to be the leading cause of losing control of a motor vehicle, but it is hard to quantify. I know from personal experience that using the term speed is an easy go to for crashes based on the fact a vehicle was moving, almost, rather than anything provable but it fails to contextualise the ingredients that contributed to it. A modern car is now loaded (and is getting worse) for distractions. 20 plus steering wheel buttons, all with their own subtle input. Giant display screens that operate the stereo, to the climate control, bluetooth everything, to information about the vehicle itself. Reportedly the Tesla model 3’s display has almost every function operable on the car housed within. Great on a desk, lethal on a road. And then theres our appalling attitude to cell phone/electronic device use. These devices require intense one on one attention deep in a conversation or scrolling and texting, be they in your hand or on a stick stuck to the windscreen or even bluetoothing via the stereo. I have lost count of how many cars i have followed doing well below the speed limit while the drivers brain is elsewhere using their electronic device. How many drivers lost patience at the wrong moment to pass such vehicles only to come to grief shortly thereafter? Relying on the old faves like speed and alcohol simply means missing all the other villains! The penalties for using a cell phone while driving in Singapore are up to 6 months in prison. Singapore’s road death toll is reducing 17% year on year and is due to hit a record low. It was 97 last year from Jan to Oct. Injuries were down 10% as well. I don’t get why having 3 beers at the pub and driving home practically sober is a $250 fine + 50 demerits, yet sending a text while driving is a $80 fine and 20 demerit points. 🙂 3 beers? And what sort of a man can’t handle his drink! Agree though that this discrepancy seems unfair. Because driving drunk casues over 100 deaths a year and we don’t recognize the danger of mobile phone use. Driving over the limit should be on the spot 28 day suspension. Driving over the old limit should be mandatory minimum six month driving ban. But anyway my point is that the ‘time’ needs to fit the ‘crime’, not public sentiment. I’d encourage you to actually look into the research on driving performance and alcohol. I’d suggest that your attitude to moderate alcohol consumption and driving would change. +1 Jimbo. All the new law has done is target those that have had a few rather than making one iota of difference to those that actually drive drunk. Don’t know where you work, JimboJones and AKLDUDE, but I suggest if you front up for work in any sort of safety-critical job with ANY alcohol in your system you’ll be out on your ear. Why do you think things should be so much laxer on the roads? Workplace “accidents” are now taken very seriously. What is this warped thinking that says it’s ok to impose risks (on others as well as yourself) on the roads? The idea of having only a few beers and driving ‘practically sober’ has been tested and debunked. Even after only a few drinks things like reaction speed are significantly impaired. Reaction speed is also impaired with age. It doesn’t necessarily make you more dangerous, you just pay more attention and drive slower. I know loads of people who used to go to the pub or have a few quiet beers after sports and drive home, Now with the new limits they just don’t. How come the road toll hasn’t decreased dramatically? Would you be comfortable hopping on a flight knowing the pilots have only had three beers each at the airport? Same principle in my opinion, machinary and booze dont go together. To be fair, airlines could kill around 1.239,9920 more people a year before they’re a similarly risky way of getting around so they could probably afford a couple of occasional beers. I wouldn’t want the pilots to have screaming kids right behind them, I wouldn’t want them to be 90 years old or 16 years old, I wouldn’t want them to have only a few hours training, I wouldn’t want them to be in bad health, I wouldn’t want just one pilot, and I wouldn’t like the plane to be checked only once a year. The important thing here is that higher speeds makes every crash more likely and worse when it happens, and lower speeds do the reverse. Lowering speed is as close to a “magic bullet” that road safety can have. Of course it isn’t the only solution, but there’s also a good reason it features in almost every crash analysis, and almost every (serious) proposal to lower crash rates. Speed really does kill. It turns fender benders into neck injuries, and broken bones into graves. Victoria, Aus, just one example, lowered speed limits from 60 to 50kph and recorded a 24% reduction in fatalities. A whole quarter! This is huge. There are so many people alive today that otherwise won’t be, how can we turn away from this kind of evidence? Of course it also needs enforcement, but this can be ramped up quickly, also engineering changes so the road says slow down as well as the sign, which takes longer. But even just starting with the limit and increased enforcement and fixing the environment over time is a bloody good start…. I agree, the biggest bang for buck would be to lower most speed limits. Surely speed cameras would be cheap as chips these days? Put one in every second street. Or tape an iPhone to a post, I’m sure there is an app for it. In theory yes Damian. Except there are other unintended consequences of lowering speed. Studies have also shown that people will naturally drive at a comfortable speed. When a road has a lower speed limit artificially imposed on it people either ignore it or follow it but with a degradation of their driving. In many places around the world where speed limits have been lowered or where enforcement of the speed limit has been increased there have been increases in accidents. Also there have been places where speed limits have been raised where accidents have then decreased. Why? Because people drive at a speed they are more comfortable with and don’t drive as aggressively etc. The road toll increases in NZ can be put down to 2 things: 1) Greater population – the previous government let in half a million immigrants (many/most of which have poor driving skills). 2) NZTA/Police focus almost entirely on speed alone. There is a reason why countries with low fatalities per capita actually enforce laws like keep left (right in most of them), and are generally more lenient on speed (such as minimising the time spent overtaking on the wrong side of the road). The countries that have vigorously enforced speeding laws have seen increases in the death toll (Australia, NZ – not surprising really). Quite interesting how the Waikato Expressway has had a 110km/h limit for a while now and the world hasn’t come to an end, cars haven’t spontaneously combusted, and people haven’t died. In fact it is probably the safest piece of road in the country. AKLDUDE – You’re overlooking that the “comfortable speed” at which you claim “people will naturally drive”, will vary a great deal from one person to another. Speed limits are not set just so the lead-footed can feel comfortable. The world contains people with a large range of abilities and capabilities, and you may notice changes in your own capabilities as time goes on. Should we allow so many people of differing levels of ability (and responsibility) to drive? That is a tough question in a country like NZ that has foolishly allowed itself to become so car-dependent. So all things considered, keeping the overall speed of traffic down to a level that *most people* can cope with is the best strategy. And whatever you do, don’t try to become a train driver. Because you will have to sit at the speed permitted for the train and for the line, possibly for hours and hours, whether you feel comfortable or not. We train young drivers to go at speeds faster than they are comfortable with too. Instead of accepting that young drivers need to drive more slowly for a few years while they gain experience, we won’t give them a license unless in the test they drive at least within 5 km/hr of the speed limit. This isn’t supporting and nurturing our young people. It isn’t being tolerant of a little delay. It’s just a way to appease the traffic god with more sacrificial waste of life. “In many places around the world where speed limits have been lowered or where enforcement of the speed limit has been increased there have been increases in accidents” – citation please? Because by far the evidence is quite clear that lower speed limits (in the absence of any other change) have reduced speeds and subsequently crashes – and vice versa. That includes here in NZ, as we have lowered and raised our open road speed limits in the past with predictable effects – see https://viastrada.nz/pub/changing-rural-speed-limits. Australia and NZ have HIGHER average speed limits than many countries with better safety records, i.e. lots of 100k rural roads and 50k urban streets that would be lower elsewhere. Focusing on the very few roads where we (or elsewhere) have higher limits ignores where most people are driving (or walking/cycling). On my last two visits to Australia I was shocked to see 110k limits on narrow two-lane roads and 70k limits racing through downtown urban settlements. Victoria have done the best to provide far more reasonable lower limits, and not surprisingly they have the best record in Australasia. Enforcement of poor driving standards is simply invisible. The number of dangerous maneuvers I see on the North Western is staggering. In one commute you’ll see five serious driving infringements. I think I’ve seen two police cars in the last three months. People don’t feel bad about coming to a complete stop and blocking a lane on the motorway because they’ve raced up a free-flowing lane to try to skip the queue in the lane next door. Cars that drive onto the onramp slip-lane to overtake cars on the left waiting to let others in. There simply isn’t any consequences for dangerous and poor driving and it’s only a matter of time before one of these idiots tries something like this on the open road and you end up with a multiple fatality. The cynic in me says the police think a congested motorway isn’t going to be be an easy win for speeding tickets so don’t bother, but for driving standards? They could fill their quotes in about ten minutes. I don’t spend much time on the motorway these days, thank God, but other types of poor / reckless / dangerous driving are absolutely epidemic in central Auckland – red-light running, queueing across intersections, close passing, and pushing on through active walk and bike phases for a start. Cellphone use at the wheel is also near-universal. Enforcement on all of the above is so dismal that I’m not surprised that some people have come to see the occasional speeding ticket or infringement notice as an unfair “gotcha”. After all, there’s virtually no chance of being caught most of the time. So our road environment and (lack of) traffic policing actually teaches people to drive like crap. With the police budget cut and neutered over the past decade, (they came with weeks of abandoning specialist traffic patrols altogether last year such was the cash flow issues), how much has that contributed to the uplift in negative crash statistics. Was it really better to pretend balancing the books, tax cuts and GDP growth to get re-elected was the be all end all? The list of contributions to the calculated cost of a fatality or a serious injury are utterly insufficient. Family members who lose their loved ones or have to cope with the ongoing disability lose ‘productivity’ in society through lost time, and their stress, alcoholism, anger, inability to cope sends waves of effects through the family and society. One crash can have effects lasting generations. I think that is factored in (hence social costs), but that’s hard to measure. If you spend your life alone with no family or friends, no one will miss you if you die no social cost. If you have lots of friends, have several children, own and run a business, involved with lots of volunteer work. Enormous social cost if you die unexpectedly. Yes. When I looked at the figures more closely once, I realised that the social cost they used could have been applied in my family to each of perhaps 8 family members from each death. When young children lose a mother and the father – with no social services available at the time – becomes alcoholic, what loss of potential does that mean for each child, and how does that affect their lives and relationships forever? When I look at the motorcycle tragedy that left my cousin with brain injuries no amount of ongoing health care can solve, the lives of his entire family have been ruined. Sister so busy supporting the family with time and emotional commitment she’s been unable to have a family of her own or to give her career much attention. How do you calculate the cost of this? +1 to everything in the article and in these first three comments. -We will install median and side barriers on all state highways over 10,000vpd by end 2020, where the geometry makes this cost prohibitive, the speed limit will be reduced immediately. -We will install RIAWS at all intersections that are classified as ‘high risk rural intersections’ and install roundabouts at a minimum of 20 intersections by end 2020. -Where any state highway is recommended for a speed limit decrease and a lower speed limit would be ‘self explaining’, we will decrease the speed limit by end 2018. Might as well get your horse and cart ready while you’re at it. Recently stories from local media outlets reporting on speed limit reduction proposals have almost overwhelmingly received negative feedback. Commenters are far more concerned about travel times and fuel consumption rather than they are about public safety. Many motorists are completely oblivious or ignorant to the social costs of each death and injury on our roads and why we better controls in place, including safer speeds. This is clearly an attitude problem. Let me get this straight, if you were on a workplace and injured or killed someone due to ignoring procedures in place primarily to ensure your safety. WorksafeNZ would come down on you like a tonne of bricks and you (and your company) would receive a huge financial penalty and/or a prosecution. The same principle should apply to our roads. Here in New Zealand the penalties are far too small and people know they can get away with it because the enforcement is also poor. +1, this also applies outside of the workplace. If I were hunting and accidentally shot and killed someone in the hunting party because I was carrying a loaded gun on my back I’d be charged with manslaughter. Why don’t we do this for driving? If you’re speeding, or fail to give way, or cross the centerline and someone dies, you should be charged with manslaughter. South Wales have Operation Snap where you can send in video footage for enforcement. Our “Report a Bad Driver” online report forms say the Police won’t look at footage. If the Police want to increase on road monitoring, getting reports from the tens of thousands of people who have dash cams would be an easy way to do it. I’ve never heard of anyone being informed about what the Police do with their “Report a Bad Driver” complaints. They could send them straight to the trash for all anyone knows. I emailed police a few weeks ago about doing some enforcement relating to chronic red light running in the PM peak at a specific Wellington intersection. I see this daily and it’s a huge safety risk. Go some response about needing to report the issue to a different channel – as if they can’t forward this sort of thing internally. It just seems like callous disregard for life and health. There is a fundamental attitude problem which goes right back to car manufacturers and their advertising. Car advertising continually stresses the excitement of driving fast and the new aggressive appearance of their latest model. No wonder we have so many highly competitive drivers on our roads of all ages. Defensive driving is just not cool. Very true, My daughter, aged 11, is great at pointing this out ” look only ever one car on the road, no traffic, no stopping ever!” She of course rides her bicycle to school and knows the advertisers view is far from the reality. Advertisers literally can’t do this according to the ASA: If you think ads are doing this then you should be making a complaint. “Principle 2 – Advertisements should not encourage unsafe practices. Thanks for that – I wonder if they have been getting around it by the small disclaimer ” filmed on closed roads” Even the latest Mercury Energy ad shows an e car burning away at traffic lights. From memory Holden got in trouble for a Monaro ad depicting driving their car on a video-game style race-track because it was too similar to a road environment when combined with a road car. It seems to be extremely tightly interpreted. When I started out in this stuff they used a Human Capital approach to valuing fatalities. It was brutal. They worked out the average earnings remaining and discounted them to a present value (at 10% per year). As a result the statistical life was only around $200k. There was a concerted campaign to get rid of that method and replace it with ‘willingness to pay’ which lifted the value to over $1mill. One of the arguments against the human capital method is it can show, at high discount rates, that babies have negative net present value as the costs all occur in the first 20 years and the earnings come later. Have they put a value on life? $4million? What is Apple worth, google, facebook? I hope we are worth more than those silly things. Has anyone actually done a real study on why our road toll is worsening? I know the police and AA like to come out with statements but they don’t seem to have much scientific basis. I would agree with Waspman, the interior distractions of the modern private vehicle are uncountable, and they do take away your focus from the road, and there are very few people that can completely avoid using a mobile phone while driving. I for one need google maps to go anywhere, so little do i have to drive, and that means manipulating my mobile to show me the way (not the best way usually). The simplest solution is to stop people driving these weapons. Make our country cycleable, busable, tramable, trainable. If everyone is on the same train, they can’t drive into each other can they? *NB obviously we will need larger capacity trains. I wish we could become far less car-dependent as a society, as a country, as a planet. Try Android Auto app. Is google maps and phone but limits functionality so less distraction. New cars integrate with it too. There is an apple version too. Of course the key is to only operate when not driving! Culture, attitude to speed, ACC, road rules, enforcement, punishments. All combine to give us our road toll. Given that most crashes are caused by people making mistakes you have to change people and have roads more forgiving to mistakes. We spend money on the latter, but not enough on the former. • Air pollution was reduced. • Fuel use increased or decreased depending on the location. I think cycling is one of those interesting road safety issues where infrastructure can make a significant difference to both safety and participation but is held back by a lack of public support. Agreed. SH25 is a classic example. Going by speed only, I could drive my car like I’m on Rally Corsica. However doing so would be hugely dangerous. That is a false statement. Police issue numerous tickets for mobile phone use while driving, failure to wear a seatbelt, failing to adhere to conditions of a driving licence, insufficient tyre tread, failing to stop at a stop sign,unsecured load etc etc. Bugger all in the scheme of things in respect of electronic device offences although it is found in research to be a disproportionate killer. Having said that I think the stats would be worse were investigators able to and uniformly check the use of phones/devices at the time of the crash and here in lies the difficulty, knowing the precise time of a crash vs the use of the device at that time. It can be vague to say the least. Trucks are of course a major contributing factor to the death toll. And we need to look at why the number is high, not just why it is growing. I recall reading somewhere that when nz police did random break tests on trucks a few years back in Auckland, 2/3rds of them failed. After that I never try and scoot in front of a truck anymore. Just talking about my experience as a cycle commuter who commutes on State Highway 1 (no alternative route). On my route I have several sections that have no or limited shoulder and a particularly nasty bridge that has limited sight lines and lanes that are exactly 3 metres (trucks are 2.5 metres). After several reports to the Police and a couple of complaints to the Waikato NZTA road safety engineer, the last I heard was “I wouldn’t ride on that section of road”. I believe the NZTA speed analysis they did a year or two ago would have recommended a speed limit of 80 kph for that section of road, but that would have been politically unpopular so the 100 kph limit remains. The report says that the section of road services several small communities with a variety of users including: pedestrians, cyclists, cars and heavy trucks. The last cyclist fatality we had in the vicinity was the Christmas before last on the Taupo bypass when Nick Calavrias was killed while riding in the very wide shoulder by a distracted driver (probably on his phone but the police accepted his story that he was looking at the motor cross park). There are several people who have expressed a desire to bike to work on that section of road but won’t due to the objective hazard. A clear case of suppressed demand. The contrast between New Zealand safety policy and the Netherlands safety policy is quite stark as in the Netherlands conflict between two disparate users would be legislated against. No cyclists on roads with speeds over 80 kph; a cycle lane would be required. Why do you make claims that are so easy to disprove? That is the sum of total number of manslaughter charges and total number of dangerous driving causing death charges. They can be viewed separately if you scroll down and click on appropriate links. Appears to confirm motorists are charged with dangerous driving causing death rather than manslaughter. I do wonder why there are separate offences though? Surely “dangerous driving causing death” is a form manslaughter. Dangerous driving causing death is probably the equivalent charge as manslaughter with equivalent penalties (ten years incarceration). The issue might be how the courts treat someone who kills someone on the road vs elsewhere (home for instance). I think generally the penalties for driving are treated more leniently as they can be viewed as “accidents” that might occur to any of us (I have no evidence, just a hunch). I wonder if it would be worth incorporating crash costs into a road pricing scheme? If you drive through a crash-prone area, you pay a surcharge. If nothing else, it would generate some public pressure to get blackspots fixed (death and dismemberment may be inconvenient, but having to pay a toll is truly unacceptable). Think of it as a no-fault scheme: instead of putting all the blame on some poor sod who was in the wrong place at the wrong time, we recognize that we’re all part of the problem. Or variable speed limits that go down by 5 km/hr after every serious crash. Again it would put public pressure on to fix the road. Also fines tied to your reported income. I think that Scandinavian policy is hilarious. And a surcharge for Audi drivers. They are the worst lol. If the fine is supposed to be there to prevent people breaking the law, doesn’t a fine linked to your income provide a more equal pressure on people? That makes a lot of sense, whats the point of a fine otherwise. Not wearing a sealtbelt and alcohol related crashes still contribute a very high proportion of crashes & deaths. 1) Seatbelts are a difficult issue as it would be impossible to retrofit all vehicles with engine lock devices if seatbelts are not being worn. The best alternative would be to use the speed cameras that are available that pick up seatbelt use. 2) The drink drive limit should be zero. 3) You should not be able to reregister/warrant your vehicle if traffic fines have not been paid. item 5.4 – there are plenty of roads with speed limits that are not set at the safe speed. Problem being that the alcohol related crashes are almost entirely made up of drivers well over the legal limit not just those that have had a few beers. Dropping the alcohol limit to zero just punishes everyone when it is a group of drivers that is causing the problem. It’d be like banning chocolate simply because some people overeat and die from obesity. As bad as the crash death trend is, it is not the total of road caused desths. Remember the VW dieselgate? It is estimated that car emissions cause another 400 premature deaths a year for people with respiratory illness. If they can ban diesel cars in Paris, why not in Auckland? The problem is the same, only the scale is different. And then there’s climate change, and all the deaths that is already causing. True too. Deaths from climate change are remote from NZ for the moment, but the time will come when that ceases to be the case as well. The 400 emissions deaths per year are happening now to NZ residents. that alone doubles the real toll from road use. Imagine if some other change in transport behavior doubled the road toll? It would be outlawed. So I think we really should look at banning diesel cars in all our large cities. The deaths they cause are real. We just don’t see them. They are not being taught the true dangers of climate change and our politicians have been some of the worst culprits for ignoring the issue. A rail network to get trucks of the roads would cut a lot of CO2 and diesel fumes, cut the spending on roads and invest it in public transport like rapid rail or trams, we are not designed to drive at the speeds we do, we don’t have all round vision like birds or the reaction time. as we travel faster our vision narrows.